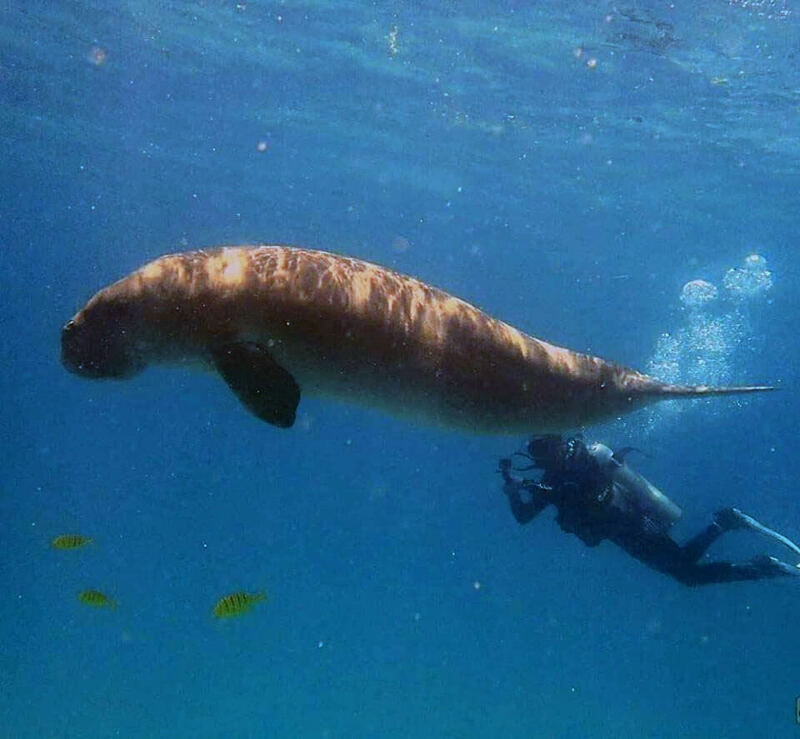 Share a special moment with this unique creature called "Dugong" in the divers' paradise - Coron, Palawan. Our Dugong Dive Coron Package offers a unique opportunity to witness Dugongs in the wild. The endangered Dugong, also known as “sea cow”, is a medium-sized vegetarian sea mammal generally found in warm waters around the coast or throughout the Indo-West Pacific. The dugong spans the water of the Busuanga coastline where they feed on seagrass for subsistence. They represent the highlight of your dive vacation in Coron. Dugongs are long-lived creatures. They can live up to 70 years. They resemble a walrus but are more closely related to the elephant. They can go 6 minutes without breathing and can dive up to 39 meters, but they usually spend most of their lives in shallow waters. 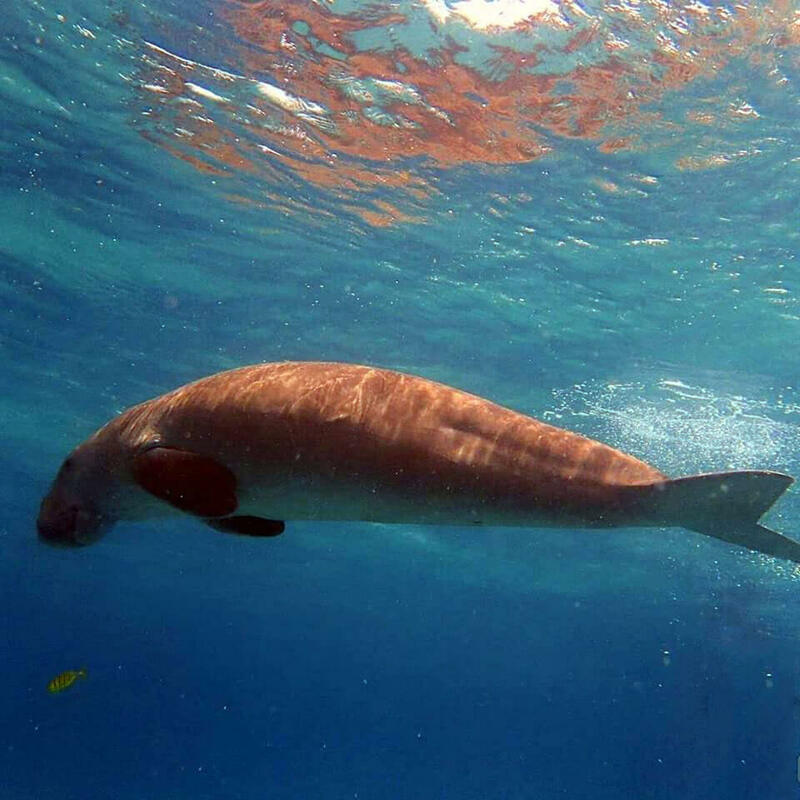 Dugongs are also closely linked to our mermaid myth and are shy and alert. Scuba divers in Coron are attracted to these mysterious marine mammals for their curious nature. 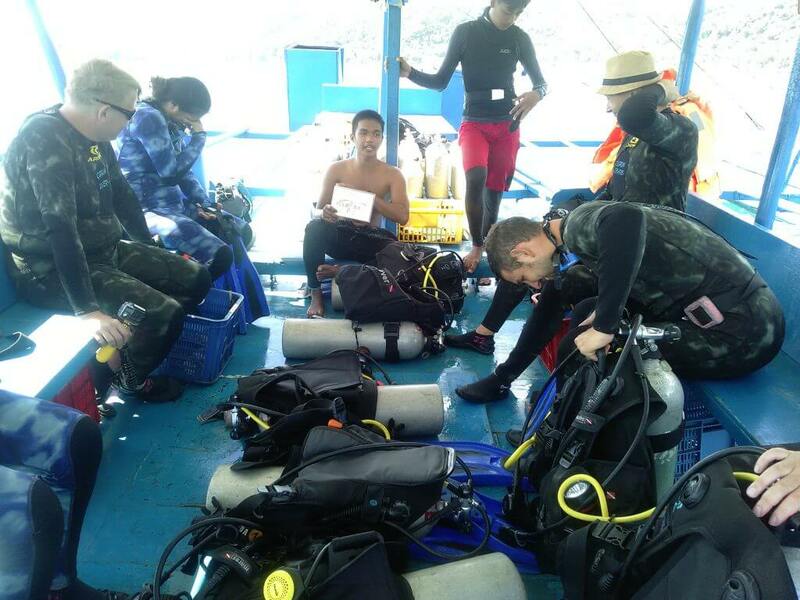 Please note that the Dugong Dive Coron Package is for certified divers only. Not yet certified? Please talk to our itinerary specialist to learn more about getting your PADI Open Water License in Coron. Our Dugong Dive full day excursion takes you to one of the remaining habitats of this fascinating marine creature. This is a unique marine life encounter highly recommended to those who wish to marvel at their beauty. Why Choose Our Dugong Dive Coron Package? We only work with the most experienced and professional dive center in Coron. Our local experts share a passion to protect and conserve Dugongs and their habitats. Our dive trips can be tailor-made to suit your specific requirements. Almost everything is included in the package, from whole day dive tours to accommodation. Although it’s possible to dive around Coron all year round, there may be some bad weather during the wet season (June to September). Dive tours can get canceled during this season. The dry season (November to May) is the best time to dive in Coron. You can expect visibility of 5 to 15m. Visibility is best between March and April. Water temperature ranges from 25°C to 31°C depending on the season. Currents can be gentle or strong depending on the tide, location, and season. To book the Dugong Dive Trip, you need a party of five, otherwise, you may charter the dive boat. We will take you on a family-owned and operated traditional Filipino boat called “Bangka” for a more authentic experience. We will pick you up at your hotel the day before you dive so you may fit your equipment and fill out the required paperwork at the dive shop. On the day of your dive tour, we will pick you up at your hotel at 6:30 AM. We will transfer you to the pier by van. From here, you will take the boat to the first dive site. The trip starts with a briefing about the Dugong and the dive trip. There will be lunch in between two dives. We will come back to Coron town at around 5:00 PM. We will do shipwreck dives on your second dive day. Dive sites may vary depending on the sea and weather conditions. Please read our Terms & Conditions before booking the Dugong Dive Coron Package. Please note that the Coast Guard might cancel boat trips due to sea conditions or bad weather for your safety. In this case, an alternative tour or activity would be suggested. Make sure to bring your own towels, water bottle, change of clothes and swim attire. Maintain a 3-meter distance from the reef. Please help preserve the beauty of Coron’s marine life by not touching or stepping on the corals while diving. There may be dangerous organisms that thrive on the coral reef. Palawan Alternative promotes environmental awareness in the community and you can do your part by not contributing to the waste that harms marine life. Help us preserve the natural wonders of Coron for the future generation by refraining from littering, using reusable bottles or containers and segregating wastes (biodegradable and non-biodegradable). Our itinerary specialist will be happy to customize the Dugong Dive Coron Package according to your interests and specific needs.